Sunwell Infrared Rotary Drum (IRD) Crystallizing / Drying System is ideal for processors of PET sheet, film extrusion and injection molding using post-industrial or post-consumer regrind as well as for processors of polyester fiber. The infra-red rays cause molecular heat oscillation acting directly to the core of the particles from the inside-out so the moisture inside the particles are quickly heated and vaporized into the circulating ambient air which removes the humidity. 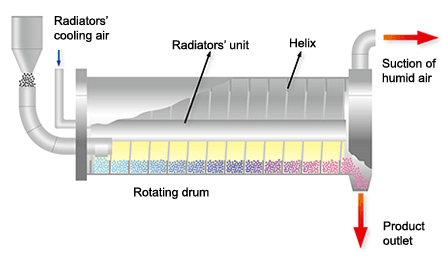 A stainless steel rotary drum with an internal helix transports are materials with a tumbling action to expose all particle surfaces to infrared rays. The output needed is dependent on the drum diameter and length as well as the radiation power. Exposure time and temperature are controlled by the speed and the IR power applied during the process. It provides continuous processing of PET flake, reducing moisture from over 4000 ppm to less than 200 ppm in 10-15 minutes even could drop to 50 ppm below if combine with desiccant drying system, compared to 5-6 hours for conventional systems. 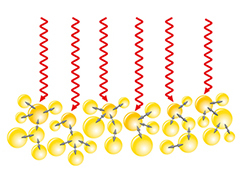 The short exposure to heat in the IRD preserves Intrinsic Viscosity properties. It has significant benefit for PET material crystallizing and drying. Up to 60% less energy than conventional drying systems. Faster start-up and quicker shut down. No segregation of products with different bulk densities.